We heard all about how Cat Cora balances a hectic life with raising a healthy family of four active boys. And today, we’re sharing a recipe from her latest cookbook, Cat Cora’s Classics with a Twist: Fresh Takes on Favorite Dishes. These Salmon Burgers with Herbed Sherry Mayo are delicious, tasty and a sure-fire way to turn regular burger night into healthy burger night! Eat it up, yum! 2. For the burgers: Cut the salmon fillet into three or four pieces and pulse in a food processor about 10 times, until coarsely ground. Don’t overmix; you don’t want the fish to turn into paste. Add the chopped onion, bread crumbs, egg and Tabasco, and pulse a few times to mix. Transfer to a large bowl. Mix in the scallion, basil, salt and 1/4 teaspoon pepper. 3. Shape the mixture into four patties, sprinkling on a few drops of water if the mixture is too dry to hold together. Pour the flour onto a plate and add a few grinds of black pepper. Lightly coat the salmon patties with flour on each side and set them on a plate. 4. Pour the oil into a large skillet (it should be 1/4-inch deep) and heat over medium-high heat until the oil shimmers but is not yet smoking. Gently place the salmon patties in the hot oil and cook until golden brown, about 3 minutes on each side. Line a plate with paper towels. When the burgers are done, transfer them to the paper-lined plate. 5. 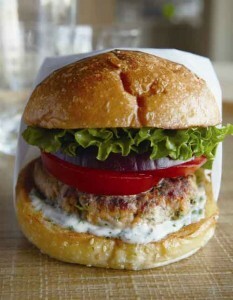 To assemble the burgers: Place each salmon burger on the bottom of a bun, spoon on the mayo, and top with the lettuce, tomato, and onion. Cover with the top half of the roll and serve.